Until this year I didn't have the opportunity to attend an Intergeo 2010 fair, but I had heard about it since my university days. Staying in Germany at the time of the exhibition I got involved with OSGeo Park, organized by FOSSGIS e.V., the German representative of OSGeo Foundation and OpenStreetMap. OSGeo projects as well as commercial service providers shared a wide exhibition area, which was planned and organized mainly through mailing list and wiki. During the three days GIS fair a quite impressive number of ongoing presentations were held at OSGeo Park, and most of the time the presentation theater was filled with visitors, who could pick some free coffee and cookies at the OSGeo bar and listen to FOSS4G related topics. We (Lars Lingner, Astrid Emde and me) tried to get a localized German version of the latest OSGeo Live DVD ready for Intergeo, but underestimated the time required by the DVD recording company, so we finally handed out the FOSS4G version. Together with a few hundred leftover LiveDVD's from the previous FOSSGIS conference, more than 1000 DVD's were handed out to visitors of the OSGeo Park. During the three days I had many interesting talks with visitors of the OSGeo Park about OSGeo software in general and PostGIS/pgRouting and OpenVRP in particular. It was great to have been there! 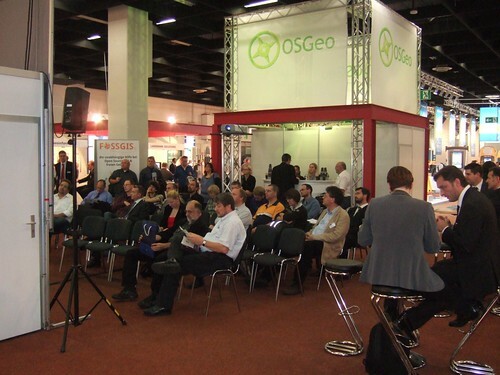 I want to thank everyone, who made the OSGeo Park at Intergeo happen. Hope to be able to attend again in 2011!